I kind of feel like I managed to trick myself with this fruit and granola breakfast brûlée. I know the magician isn’t supposed to be fooled by their own illusions, but somehow, despite knowing full well that this recipe is made from 90% healthy breakfast ingredients, it tasted like a sinfully luxurious dessert. Underneath the crispy, crackly sugar topping and the creamy Greek yogurt, there’s a thick layer of fruit and granola. Obviously you can use whatever fruits you fancy – I used strawberries, grapes and blueberries (three of my absolute favourites). Since this recipe only has a few ingredients, you also need to choose a really good quality granola. 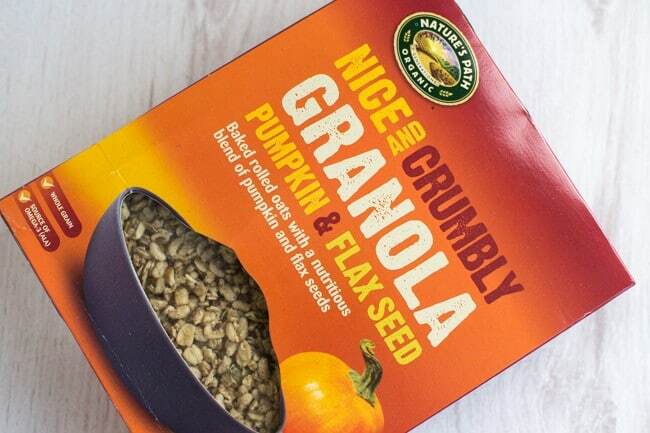 I used this crumbly pumpkin and flax seed granola from Nature’s Path. The flavour of this stuff is just gorgeous – it’s got a pinch of cinnamon, which gives it a lovely wintery flavour, and the pumpkin and flax seeds are yummy (I’m really getting into seeds lately, if that’s not too weird a thing to say). I’ve been enjoying it just served with milk (like a normal person would do), or sprinkled over yogurt, but it was fun to try using it in a different way too, and it’s definitely something that will be repeated. The Nature’s Path granola has quite a fine texture, so it was perfect for mixing with the fruit straight from the box. But if you do find any larger lumps, just break them up a little before adding them to your ramekin. Then add a good dollop of Greek yogurt and a little sprinkling of brown sugar. I originally tried browning the sugar under the grill (broiler) – I like my recipes to be as simple as possible, so I avoid using specialist equipment if I can. It was really tasty cooked this way, but it’s not ideal – the sugar doesn’t brown or crisp up in the same way, and you do risk the yogurt getting a bit warm on top. Basically, the sugar just melts – which is tasty, but not really the breakfast brûlée we’re going for. So if you have one, use one of those little kitchen blowtorches instead, to give that nice crispy layer of caramelised sugar. And then just crack through the top with your spoon, and dig in! The sugar takes on such a rich caramel flavour as it browns, it’s really amazing. Make sure you scoop right to the bottom to get that lovely fresh fruit and tasty Nature’s Path granola! Place the chopped fruit and granola in the bottom of a large ramekin, and mix to combine. Spread the Greek yogurt on top, then sprinkle with brown sugar. If you have one, use a kitchen blowtorch to caramelise the sugar. If you don't have a blowtorch, you can melt the sugar for a minute under the grill (broiler), but it won't crisp up in the same way - a blowtorch is ideal. This is such a brilliant idea, would definitely make me eat granola more often – my breakfast choices are terrible lately. I don’t think there is a season for this type of healthy breakfast. I am fighting a virulent cold virus at the moment so really trying to eat loads of healthy foods. Oh my, what a super idea! This is packed full of my favourite things and perfect for these dark January mornings when I have to get up before the sun! What a winner of an idea… I’m thinking this would lush over the Christmas holidays – plus I need to find more reasons to use my blowtorch!!!!! 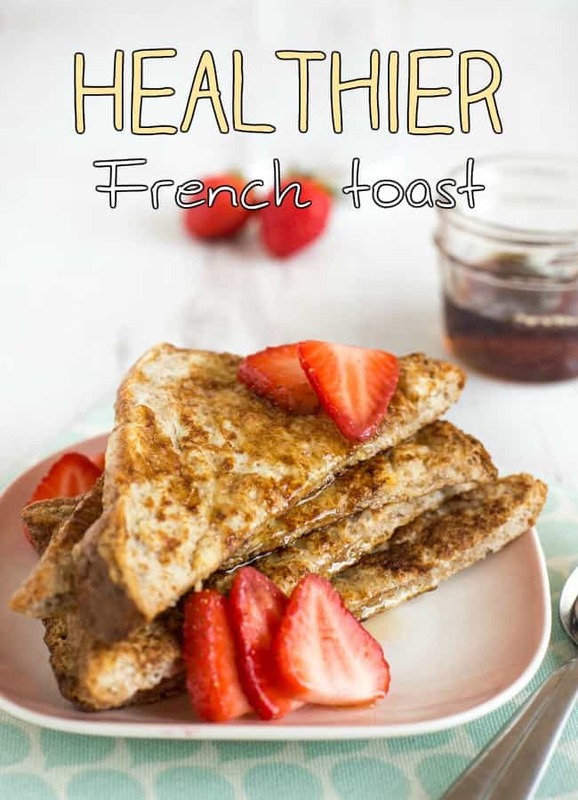 I really love this idea, I bet the brûlée top makes it so indulgent, you’d forget you were having a really healthy breakfast. One to try! That is such a good idea Becca, I do like the idea of an indulgent pudding for breakfast. Definitely makes these cold mornings more bearable! Mmmmmm Desert for breakfast! This is an idea that I can most definitely get behind. Love this idea, I love good quality greek yoghurt and fruit for breakfast, and granola too, but never thought to brulee it like this! Ace idea! Oh yum! But this would be dessert rather than breakfast for me, I suspect….. have you ever tried peaches smothered in Greek yoghurt with a caramel top like that? Or even better, half yoghurt, half cream or creme fraiche….. wonderful. P.S. Did I tell you I bought a tablecloth from the company you recommended, and have been using it in the motor home all week. Very impressed! Ooooh this would be so good with peaches! Yuuuum.